Question: I’m looking for a bit of enlightenment regarding lubricants, tool steels and die surface coatings for stainless-steel applications. A couple of months back you wrote about lubricants having EP additives and wetting agents; could you elaborate? What base materials and surface coatings would you recommend for stamping stainless steels? Should we avoid D2 with stainless due to the chromium content in both materials? We have recommended this on some of our tool builds but most tool shops would prefer to stay with D2 and many say they have not had adhesion issues with their other customers. A: The Specialty Steel Industry of North America (SSINA), a trade association representing virtually all of the producers of specialty steels in North America, claims that working with stainless steel is not difficult, it’s just different. With that in mind, let’s first consider how stamping stainless steels differs from plain carbon steels. Ferritic and austenitic stainless steels work-harden at a faster rate than do carbon steels. As a result, higher pressures are required to form stainless steel as compared to plain carbon steel of the same thickness and temper. The chromium in stainless steel reacts naturally with oxygen in the air to create a passive chromium-oxide (Cr2O3) film on the sheet surface. Passive simply means the surface no longer reacts chemically to its surrounding environment. It is this passive film to which stainless steels owe their superior corrosion resistance. Even though this layer is very thin, it significantly increases the level of friction between the tool and the workpiece. The combination of high forming pressures and surface friction results in significantly higher tool-wear rates than those used to form carbon steels. These higher wear rates increase tool maintenance, downtime and production costs. As a result, proper processing methods, tool coatings and lubricants must be chosen in order to improve overall tool performance. Extreme-pressure (EP) additives in lubricants provide excellent anti-galling tendencies under extreme heat and pressure conditions. EP additives (see below) commonly used in metalforming lubricants are chlorine, sulfur, and phosphorus compounds. When chlorinated hydrocarbons, for example, are added to stamping lubricants, the he generated at the tool-sheet interface releases chlorine and allows it to react with iron in the steel. This reaction forms an iron-chloride film which is an excellent EP lubricant. 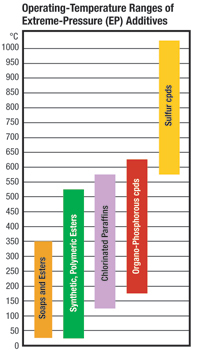 Sulfur and phosphorus form sacrificial films similarly, each being effective within specific temperature ranges. Die steels today are a quantum leap over what was available even 10 years ago. Most tool-steel suppliers no w offer an array of powdered metals (PM) as a base material for premium tooling components. This type of steel has uniform and consistent microstructures that improves tool strength and wear resistance. PM materials also serve as good substrates for additional wear-resistant coatings. However, D2 may still be a very good tool-steel choice for many stainless-steel applications, especially if a tool surface coating is applied. Regardless of your tool-steel selection, of prime concern should be the tooling surface finish. The micro-finish on the surface of the tool steel can be surprisingly rough, even when it appears smooth to the naked eye. Working, heat treating, cutting, and grinding can leave undesirable surface imperfections including pits, craters, scratches and micro-cracks. These surface flaws increase flow resistance during metalforming, which increases friction and heat buildup and promotes galling and tool wear. Today’s grinding and polishing materials provide surface finishes that were hard to come by a few years ago, but are commonplace today. These improved surface finishes reduce the coefficient of friction and allows many dies to run faster and last much longer. Surface coatings increase tool-surface hardness and reduce friction. They often complement lubricants by providing a permanent barrier between the tool and the workpiece. Surface coatings also can help reduce the adhesion problems common with uncoated D2 tool steel by providing a physical barrier between the chromium in the tool steel and the chromium in the stainless-steel sheet. The most widely used coating processes are physical vapor deposition (PVD), chemical vapor deposition (CVD), and thermal reactive diffusion (TRD). The primary goal of each process is to protect the surface of the tool against abrasive, adhesive, and/or corrosive wear. The key is to match the correct coating type to the stamping application and tool steel selection.